If there’s ever an appropriate time to speak your mind casually, it’s with your friends, when you can be your most uncensored. However, the thoughts we share casually might often be derived from unconscious stereotypes. In Kamila Shamsie’s 2017 novel Home Fire, the character Eamonn is the son of Britain’s Home Secretary who is known for his rigid stance against British Muslims involved in terrorist organizations and who has suppressed his own personal Muslim upbringing. Eamonn is also romantically involved with Aneeka, who wears a hijab and whose twin brother has left England to join ISIS in Syria. In the novel, Eamonn’s friends begin to mock his involvement with a more traditional practicing Muslim woman, utilizing the literary device of hyperbole to tease him. Through the crafting of Eamonn’s character, Shamsie exhibits how difficult it is to adhere to two separate societal expectations of culture. In one particular scene, Eamonn meets his friends in a park for what ends up being a laid-back sort of intervention on account of him spending much of his time with Aneeka over them. Eamonn is jokingly judged by his friends for beginning to “act” Muslim, contributing to the notion that if he wants to fit in with his British friends, he needs to act less Muslim, and more standardly British. His friend Mark jokes, “Twenty-something unemployed male from Muslim background exhibits rapidly altered pattern of behavior, cuts himself off from old friends, moves under the radar. Also, are we sure that’s an evening shadow rather than an incipient beard? I think we may need to alert the authorities” (Shamsie 84). Another friend goes on to joke that they haven’t lost him completely because he is still drinking alcohol. This phrasing in particular suggests that Eamonn’s supposed shift toward becoming more Muslim culturally sparks an influx of culturally essentialist jokes by his British friends. The hyperbole stating that “we may need to alert the authorities” connotes that any linkage to Muslim tradition must be something worthy of reporting as suspicious behavior (Shamsie 84). In passing this exaggerated implication in a casual, joking manner, Eamonn’s friend Mark helps illuminate how commonplace it is to assume that a British individual with strong links to Muslim identity becomes an internal enemy to England. The effect of hyperbole in this example directly correlates to the understanding of Eamonn’s friends regarding British and Muslim identity. Individuals such as Aneeka’s brother, who isolated himself from his family and defected to ISIS, act as a scapegoat for the type of cultural stereotyping people have about British Muslims. 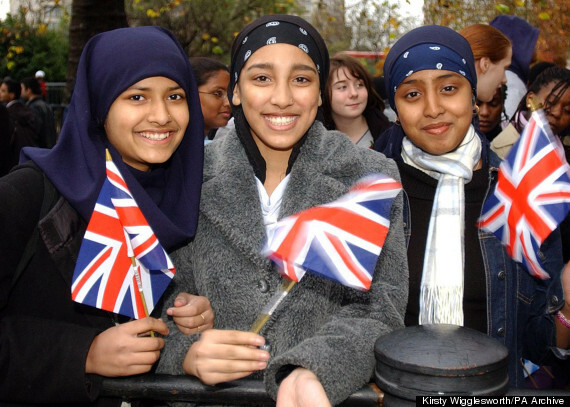 Anybody in England with any sort of Muslim identity becomes immediately stigmatized as dangerous when there is an “altered pattern of behavior” (Shamsie 84). While Eamonn’s friends might be exaggerating in their joke about alerting the authorities, their joke is a harsh reality for Britons who feel a need to protect and separate Britain from Islam. Shamsie, Kamila. Home Fire. New York: Riverhead Books, 2017.